Aachen, November 2017 – Machine learning is a way to facilitate the process set-up on an injection moulding machine and, in the longer term, to automate it. Under the lead topic "Plastics Industry 4.0", IKV is occupied with the generation of intelligent models, and, at the International Colloquium Plastics Technology, will present a new approach on how to usefully combine simulation with real test data in order to make the overall setting-up process easier. Optimisation of the setting-up process for injection moulding has been a research topic at IKV for some years now. How can a production system autonomously optimise itself with regard to the pre-defined quality characteristics of the manufactured parts? One approach is that of machine learning, which draws up relationships from complex data and uses them specifically for tuning the process. One condition, however, is that the algorithms used – for example artificial neuronal networks – are first trained with the help of complex injection moulding tests. Although the algorithms are becoming ever more efficient, machine learning has not yet become established due, as mentioned above, to the amount of work involved. One solution to reduce this is to use numerical simulations that can be performed automatically. 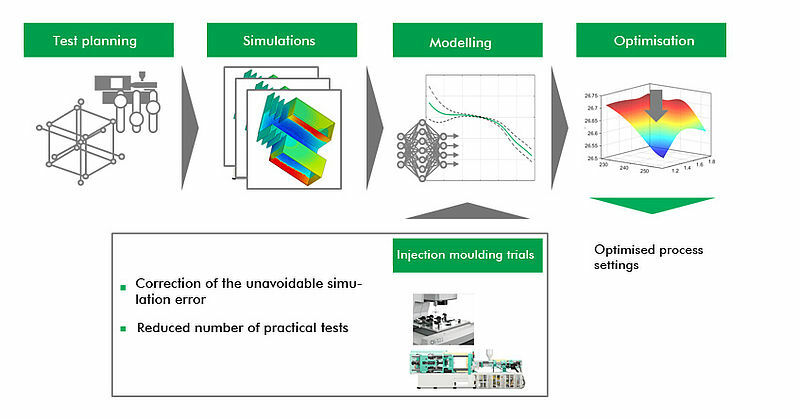 Injection moulding simulations are used in order to learn, without complex, time-consuming trials, the relationships between setting parameters and resultant quality data. With model assumptions, however, simulations have so far been unable to reliably simulate the injection moulding process without deviations from reality. Established models and process data serve as the starting point for the machine set-up and in most cases have to be readjusted in several iteration steps. 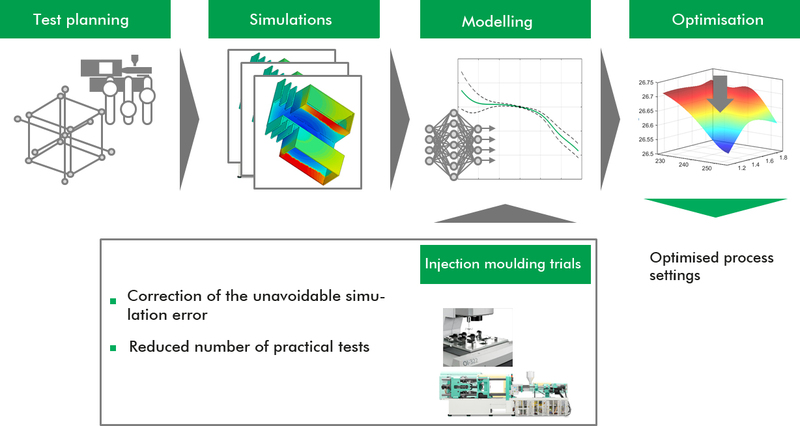 In a new approach, IKV is now trying to find suitable machine-learning models for setting up the process by using simulations in combination with real test data (cf. diagram). With the data combination, the aim is to minimise the necessary trials on the machine and consequently make the use of machine-learning processes economically viable. As a result, the process set-up can be carried systematically and independently of the intuition and experience of the operator. At the same time, a precise knowledge of the relationships and optimised parameters ensures a higher quality of the moulded part and greater economic efficiency of the overall process. The methods will be presented during the Colloquium on February 28, 2018 and explained as part of IKV 360° in IKV's pilot plants and laboratories.